Mildred Kennedy Masters, 83, of Albany, GA, peacefully joined her Lord and Savior at her home on March 25, 2019. A visitation will be held Wednesday from 6:00 p.m. until 8:00 p.m. at Mathews Funeral Home. Graveside funeral services will be held Thursday at 2:00 p.m. at Westview Cemetery in Wrightsville, GA. Rev. David Oliver will officiate. Mrs. Masters was born July 19, 1935 in Wrightsville, GA to the late John Beverly and Katherine Burnley Kennedy of Wrightsville. She graduated from Wrightsville High School and the Georgia State College for Women (GSCW) in Milledgeville with at teaching degree. 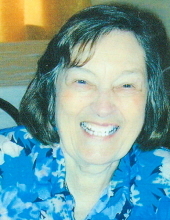 She moved to Albany in 1957 and taught at Mamie Brosnan Elementary and Northside Elementary schools. On March 14, 1959, she married the love of her life, Charles Melvin Masters, and later became a mother and homemaker. They have resided in Albany and had been married for sixty years. Mildred was a loving and caring wife, mother, grandmother, and great grandmother. Mrs. Masters was an active Sunday School teacher and served as Board Secretary while she was a member of First Christian Church of Albany. Mildred enjoyed music, dancing, family, trips to the mountains, and to Daytona Beach, where she could walk on the beach and feed the seagulls. She is survived by her loving husband, Charles Melvin Masters, son Chuck Masters (Leah), son John Masters, all of Albany, GA, daughter, Beverly Sonnedecker (Gary) of Evans, GA, brother John Kennedy (Virginia) of Tallahassee, FL, ten grandchildren, and six great grandchildren. She now joins her parents and daughter, Katherine Hollis who preceded her into Heaven. Those desiring may make memorial donations in memory of Mildred Kennedy Masters to Willson Hospice House, 320 Foundation Lane, Albany, GA 31707. Local obituary courtesy of Stanley Funeral Home and Crematory/Wrightsville Chapel. To send flowers or a remembrance gift to the family of Mildred Kennedy Masters, please visit our Tribute Store. "Email Address" would like to share the life celebration of Mildred Kennedy Masters. Click on the "link" to go to share a favorite memory or leave a condolence message for the family.